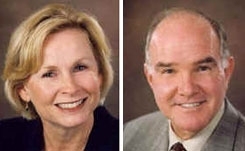 Loula Fuller and Dan Myers are attorneys who practice dealership law. One shoe has fallen and the other is hanging in the air. What to do? Dan Myers and Loula Fuller, attorneys who practice dealership law, have some advice for Chrysler and General Motors dealers: You must prepare now to protect yourself and your business. One shoe has fallen and the other is hanging in the air. What to do? If you are a Chrysler dealer, you need to fill out and file a proof of claim with the Bankruptcy Court in the Southern District of New York. In an abundance of caution, you need to get a financial evaluation of your dealership's net worth. You also need to add up all the money spent over the past five years on relocations, renovations and new facilities. You need to put together a collection of all the correspondence by and between you, the dealer, and Chrysler, the manufacturer. Focus closely on forecasts made by Chrysler or requirements forced upon you by Chrysler. No matter how long Chrysler remains in bankruptcy, when the dust settles, the company will try to eliminate a significant number of dealers. But try as they may, they are not going to be able to do it by just saying, "You're gone." In many instances, dealers were required to build, renovate, relocate or remove non-Chrysler brands. Each of those actions was required by Chrysler and cost you, the dealer, money. In most instances, you did what was required, relying on representations made to you by Chrysler employees and coming directly from Auburn Hills via electronic communications. Those communications may have, in some instances, contained forecasts of future sales that were false or inaccurate, market plans that were known to be unachievable and projections of Chrysler strength that were false and misleading. Any of these actions by Chrysler make it difficult or impossible to eliminate you as a dealer, regardless of the bankruptcy issue. The main thing to remember is that you are not alone or unarmed. You need to take as much control of your future as you can by putting everything in order in case you need to defend your dealership investment. If you are a GM dealer waiting to see if you made the list of 1,000 dealerships to be closed, you must do some preparation now. First and foremost, you need to find out from your zone what the plan is for your market area. That gives you a heads-up on where you might stand. Next, you need to gather all correspondence by and between your dealership and GM. You should go back five years on all expenditures you have made on your facility at the behest of GM. Then you need to put together all the documentation that shows any undualing or dualing of franchises that occurred in the past five years. You also should get an evaluation of the value of your dealership, including line makes, buildings and land. A number of accounting firms quickly can provide you an inexpensive, down-and-dirty evaluation. You need to load up for a fight whether or not GM goes into bankruptcy and whether or not you get the call on Monday informing you that you did not make the cut. Remember that just because GM targets you, doesn't mean it can carry out the plan. State laws provide you termination protection if GM does not seek bankruptcy protection. The Federal Dealer Day in Court Act and the bankruptcy laws themselves protect you from fraudulent misrepresentations that may have been made to you. If you are a Hummer, Saturn or Buick-Pontiac-GMC dealer, you have spent money complying with GM directives, money that was required so you could remain a GM dealer. Your reliance on the statements, demands and threats of termination are your leverage in dealing with the factory. If you are a Cadillac or Chevrolet dealer, you know that those two lines will survive, and that means GM must show that you are not in compliance with the terms and conditions of your Dealer Sales and Service Agreement. There are laws to protect you from false noncompliance claims. Fraudulent misrepresentations can eliminate the protection a Bankruptcy Court would otherwise offer. Finally, keep in mind that GMAC and Chrysler Financial are really the Cerberus group. When you signed up initially, it was with a factory-controlled finance source. You were induced to use the financial arm in order to be competitive. When GM sold control of the financial arm to Cerberus, your entire financial relationship changed. No longer were you all working toward the same goals. The sale and change of policy and procedures could result in some lender liability issues, and we will be looking closely at how Cerberus financially squeezes out dealers and how they relate to the dealership reduction plans of both GM and Chrysler.